Vito's WordPress Theme Vito's WordPress restaurant website theme is a cheerful template, thanks to which you can show how open your restaurant is to customers. Build restaurant website and earn money on food delivery. Improvement with WordPress Take a moment to look at Vito's – cheerful WordPress restaurant template. It could bring plenty of benefits to your restaurant. You will get all the help you need with theme plugin. Moreover, Pego will support your website for 6 months. Happy restaurant website theme Vito's is full of positive energy. This WordPress restaurant theme has also a lot of clever features. Your customers are not only able to place online orders. Vito's will transform your website into a fun place to visit, for example, thanks to beautiful pictures or blog page. Time for a delicious look Vito’s is without a doubt especially valuable theme for a pizzeria. However, other restaurants with Italian cuisine or fast food places may use it with success as well. 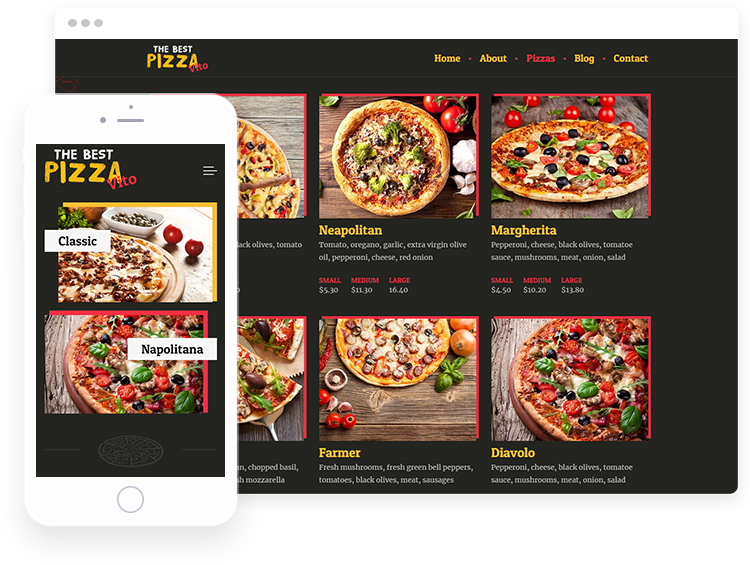 This restaurant website template helps you show that the restaurant is a fun place to order really delicious food from. Extra advantages Why are website templates from WordPress so popular all over the world? They are modern and easy to manage. Moreover, the professional theme will help you gain appreciation from the customers and, consequentially, may cause increase in sales.